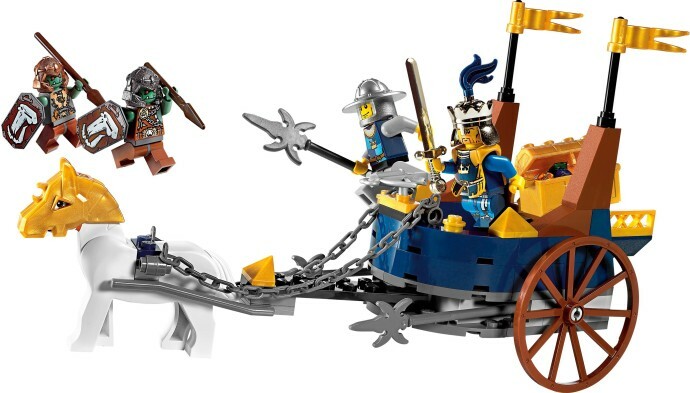 Today's random set is 7078 King's Battle Chariot, released in 2009. It's one of 6 Castle sets produced that year. It contains 103 pieces and 4 minifigs, and its retail price was US$19.99/£13.99. It's owned by 2520 Brickset members. If you want to add it to your collection you might find it for sale at BrickLink or eBay. Lots of Castle sets lately! The best Castle theme ever. The horse headpiece first appeared in the second Knights' Kingdom line, and versions of it appeared in various sets in each knight's livery except purple... but in one issue of LEGO Magazine, there was a Knights' Kingdom scene with a purple one. And I will always remember that. The king is so awesome. That’s who’d I’d like leading me. Not that horse that looks like it doesn’t know what it’s doing. I don't know Your future president, I want my king to have a useless cape! We’re loving the castle binge! @Balthazar Brannigan Was the purple horse piece an actual picture in the magazine or a drawing? I do love how we're starting to cycle through some 2009 sets. 3rd set from the Castle theme in 4 days and 2nd straight 2009 set (7198). Here is the thing, I prefer the cart that we saw before. Those gold pieces and vibrant colors don't mean a thing to me. @The Teenage Brickster It was an actual piece, on a horse Danju was riding! It was in a staged scene with various sets, and back then it wouldn't have occurred to me that it could be a render instead of a photograph... but I also assume that back in those days, that was probably true. Another great Castle set! Keep it coming! What has happened to Huwbot's preference for Clickits? Castle galore in a row!!! I love fantasy era for dragging me out of my dark ages, but this is probably one of its weakest offerings. Despite its shortcomings, getting shields and a pretty deluxe king minifigure (back printing and leg printing too!) for cheap made it desirable still. Why on earth would you carry a large treasure chest in a battle chariot like that? What are you gonna do, throw the gems at people? @Brickalili ... well, they have sharp edges. You could put someone's eye out. That poor horse. That chariot is as big as a van. I think I mentioned this on the last chariot post, but I'm fixing up my Monster Fighters Mummy set right now! All I'm missing are the two green cylinders that make up the lanterns on the sides of the vehicle. Maybe all start working on my Gandalf cart soon as well, it was always one of my favorites. Surprisingly, I don't think I ever got any Fantasy Era sets. I drooled over them like crazy as a kid, especially the ones with dragons and dwarves, but my parents never bought any. I can't say I remember this set. It looks great! Fantasy Era was a lot of fun, though it’s always surprising to me how many people both enjoyed Fantasy Era and felt the 2013 Castle sets were too cartoonish or unrealistic! Even the sets like this or King’s Castle Siege that are less focused on fantasy races feel almost Seussian in how much weight a single horse can pull or a few skinny columns can support! That said, a lot of the DNA from this theme wound up making its way into LEGO Elves, with the added benefit of all the new parts that had been introduced in the intervening time! I can definitely draw a line between this and Azari’s chariot, King’s Castle Siege and Ragana’s castle, etc. I think that’s one of the things that keeps me patient even when my own favorite themes retire… that sense that the stuff I loved about them will keep showing up in new, surprising, and often even refined forms in the future. This is a great set, glad I own it. Four minifigures and a horse with headcovering, dark blue pieces galore and a nice bundle of weapons, shields and armor. The playability is huge! @David1985. I would not say that it is the best Castle theme, because, in my opinion, Black Falcons, Dark knights and Crusanders are the best one (also Forestmen), but with this theme, I came back from my Dark Ages. Trolls are interesting, but I prefer real knights!! More decent castle sets, Horse and 4 minifigs and good parts , treasure + extra weapons. Of course I prefer buildings , but this is still a small set with a lot of variation. The rest of this year's sets were fantastic, with Drawbridge Defense, Troll's Mountain Fortress and of course Medieval Market Village. That is a BIG! Chariot for one horse, oh well, I remember seeing this at TRU and really wanting it but not having any money. Loved this line? ?